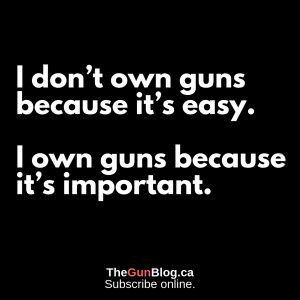 TheGunBlog.ca — Canadian Prime Minister Justin Trudeau said in a radio interview he wants to limit “easy access” to guns by criminals. He’s considering banning handguns from sport shooters to tighten a law that can put anyone in jail if they buy, sell, have or transport any firearm without police authorization. Trudeau made the comments in French to Paul Arcand on 98.5 FM in Montreal, according to the replay on the station’s website today. The Q&A on guns starts at 17:28 in the playback and lasts about 45 seconds. Arcand: My colleague … told me earlier you are considering maybe prohibiting certain types of firearms in Canada, in other words tightening controls on firearms. It’s true? Arcand: You will ban guns? Trudeau: We are in the midst of thinking about how we will do better to counter violence done by handguns and assault-type weapons, yes. It’s unacceptable what’s happening. Arcand: But then, ultimately, banning them? Trudeau: There are different ways we’re looking at, but yes, we want to limit easy access that unfortunately remains for criminals for handguns and assault weapons. All guns are banned for everyone in Canada under threat of prison unless they have a temporary waiver from the federal police. More than 2 million hunters and sport shooters have the permission as a firearm Possession and Acquisition Licence. It takes months to obtain one after safety courses, tests and background and reference checks. He’s also planning Bill C-71 as a new law to make it harder for hunters and sport shooters to buy, sell, have and transport firearms. It will start by immediately prohibiting rifles owned by as many as 15,000 people and then seize their guns after they die. It will also put private firearm sellers with gun licences in prison if they fail to report themselves and the potential buyer to the federal police before a transaction. Trudeau said in March while marketing Bill C-71 that it’s “not a requirement” to show a licence when buying a gun. He omitted that it is a crime to buy or sell any firearm without a licence. “It is possible that the measures referred to Thursday by Trudeau could make their way into the new bill,” the Canadian Press said, without saying where it got the information. The article was published on the website of the Montreal Gazette. Today is the 29th anniversary of the Ecole Polytechnique massacre, an annual reminder of the value of being trained and armed to protect life if attacked. Canadian politicians and police have made armed defence almost impossible for everyone but themselves.